Long before 3-D movies, 36 screen cineplexs and IMAXs, we had black and white movies with no sound. All of the music was provided by a single talented musician hired by the movie house that would create an entire movie score for every showing of the film from a single console located usually off to the side where they could keep a sharp eye on the screen action. This was a short lived time period. Talkies soon became the standard movie release and the organs slowly faded from our entertainment culture. Many were sold or given to churches, a few found new life in private homes, but most were dismantled for scrap metal during World War II. Only a few survived. In fact, today, the Ohio Theatre organ is only 1 of 40 left in their original locations and still working throughout the United States. 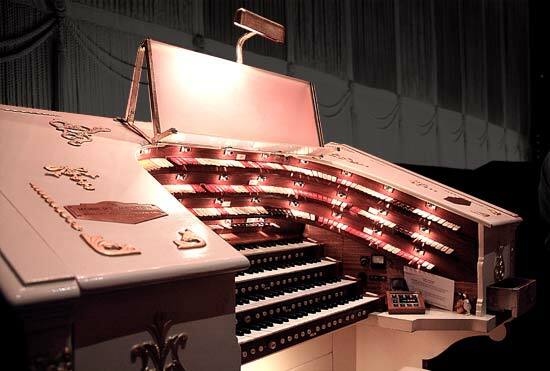 The Ohio Theatre organ, nick-named the "Mighty Morton" was built by the Robert Morton Organ Co. Factories, located in Van Nuys, California. The organ consist of about 2500 pipes ranging in size from about 1/2" to over 16' in length. 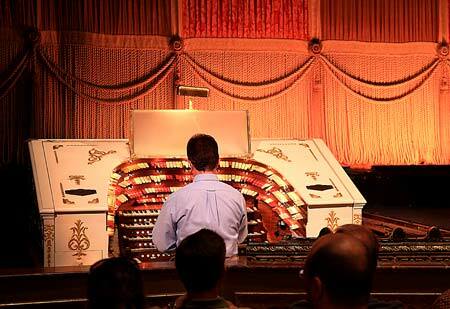 The majestic organ is powered by a 25 horsepower turbine-type blower located in the basement of the Ohio Theatre. The console of the organ, and the only part visible by audiences, is raised and lowered by a screw-driven lift. It is constructed from solid mahogany, with four keyboards, 325 stop keys, 244 keys, 32 pedals and more than 70 additional controls. At the height of the organ accompaniment, organ players were much in demand across the country. Organ players were largely responsible for the success or failure of any movie release and therefore commanded a hefty salary. Quality organist's could make $60,000 or more a year. The Ohio Theatre is fortunate to have the talented Clark Wilson as the main organist. Clark has a number of recordings available and travels the world spreading his love of organ music. Clark remembers as a youngster attending one of the last shows scheduled to be performed at the Ohio Theatre and listening to the Mighty Morton. It was this experience that helped him to decide to pursue a career in learning all the facets of playing and maintaining theatre organs.